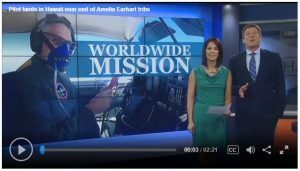 ATCHISON, Kan. — Exactly 80 years after Amelia Earhart’s famous flight, a pilot from San Antonio, Texas has retraced her path around the world. 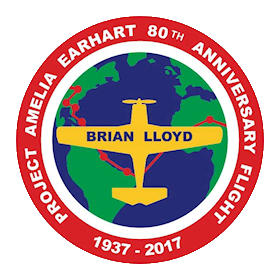 On Thursday evening, Brian Lloyd landed his Mooney 231 aircraft at the Amelia Earhart Airport in Atchison, Kansas and celebrated the completion of his journey. Getting back on solid ground never felt so good for Lloyd, who traveled more than 28,000 miles on his trip. He began his adventure on June 1st, the exact day of the 80th anniversary of the day Earhart began her fateful trip with navigator Fred Noonan. Lloyd says he has more than 50 years experience as a pilot. He was solo in the cockpit for as much as 17 hours at a time. He said he welcomed his stops along the way, where the various airports air traffic controllers, mechanics fuelers and others signed words of encouragement on his plane. 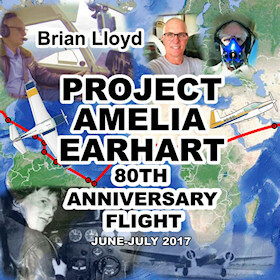 Lloyd started planning for the flight five years ago, and bought his airplane specifically for the around-the-world trip he made to honor Earhart. “Facts still remain that her legacy was important then when she was doing what she was doing when she was alive,” said Travis Grossman, interim director of the Amelia Earhart Birthplace Museum in Atchison. “It’s important now. She was a real glass ceiling breaker and a remarkable woman. Lloyd says he was honored to pay tribute to Earhart. After the final leg of his trip, Lloyd says he was going to stay the night in Atchison. Oakland arrival of Brian Lloyd in his aircraft Spirit. Video by Vaibhav Sharma. Listen to audio. Project Amelia Earhart. Spirit N916BL departing Kona Gnd/Twr (LiveATC.net) Jul-30-2017-1630Z. Recorded by Phil Karn. 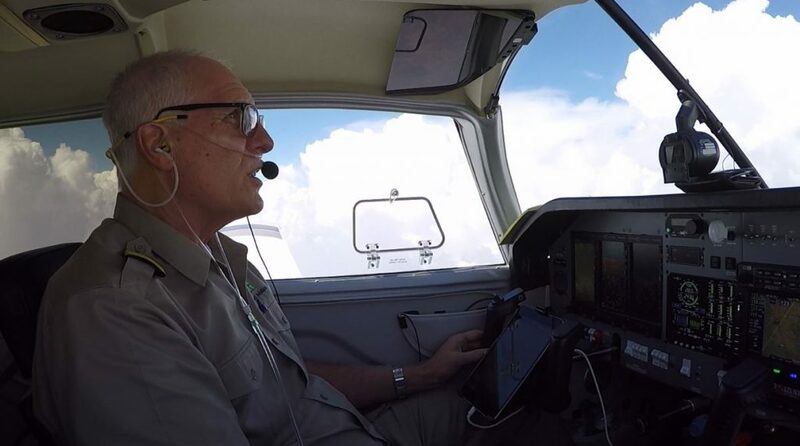 HONOLULU (HawaiiNewsNow) – Nearly two months ago, aviator Brian Lloyd took off from an airfield in Fort Lauderdale inside a single engine aircraft. The 63-year-old flight instructor from San Antonio, Texas, is following the flight path of Amelia Earhart’s 1937 round-the-world attempt. He landed in Honolulu on Monday night. “After having flown literally 28,000 miles in her shoes, my respect for her has risen a thousand fold,” Lloyd says. 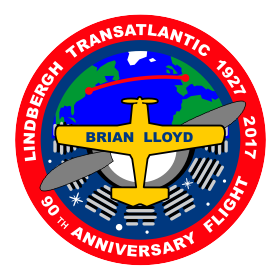 In his plane, which is named Spirit, Lloyd has already touched down in 20 different countries during what he calls ‘a very difficult flight.’ But it’s also been memorable: over Brazil, for example, a military jet challenged why he was in that airspace. In the skies near New Zealand, his engine suddenly quit over the ocean. “Through using the electric fuel pump and manipulating controls, I was able to get the engine running well enough to get me back to New Zealand,” Lloyd said. Earhart was heading toward Howland Island when she disappeared. Lloyd dropped flowers over the site. “To me, it was important to do that,” he said. His longest time in the cockpit was 17 hours, from Pago Pago to Honolulu. During his journey he has made many friends talking to some – mid-flight over a ham radio. At every stop, well-wishers and people who have aided his journey autograph the exterior of his airplane. Lloyd estimates that it cost around $60,000 to re-trace Earhart’s route. Friends helped, but he put up most of the money himself. On Saturday he leaves Hawaii for the last leg to Oakland – and a final touch down. “I don’t plan to kiss the ground, but I may do a little dance when I get there,” he said. Video of Brian Lloyd and Spirit in and around Fortaleza Brazil during early June 2017, by TMA Fortaleza Planespotting Team. ©2017 TMA Fortaleza Planespotting Team CC-BY 2.0 – used by permission. Fueling Spirit by hand pump at Aero Club de Dakar in Senegal, the same way that Amelia Earhart did: “Well, we have to fuel the airplane a little differently than we do usually.”-Brian Lloyd, 10 June 2017. Amateur Radio Newsline interviews Brian Lloyd. Released 7 June 2017. Thanks to Akash Niddha in Suriname for this video. Audio: Brian Lloyd in Dominica, Q95FM interview, by Atherton Martin. Rosseau, the Capital of Dominica, just after take-off from Canefield Airport on 2JUN2017. Video by Brian Lloyd. Test flight in USA during May 2017.